What Is a Brick Lintel? Brick laying is the art of joining bricks together to create a sound structure. Bricks are use to build houses, schools, factories, barbecue grills, walls and more. Each of these applications requires strict attention to detail to ensure that the brick structure is level, square and rigid. Brick is often laid over block foundations and is preferred for its aesthetic appeal. 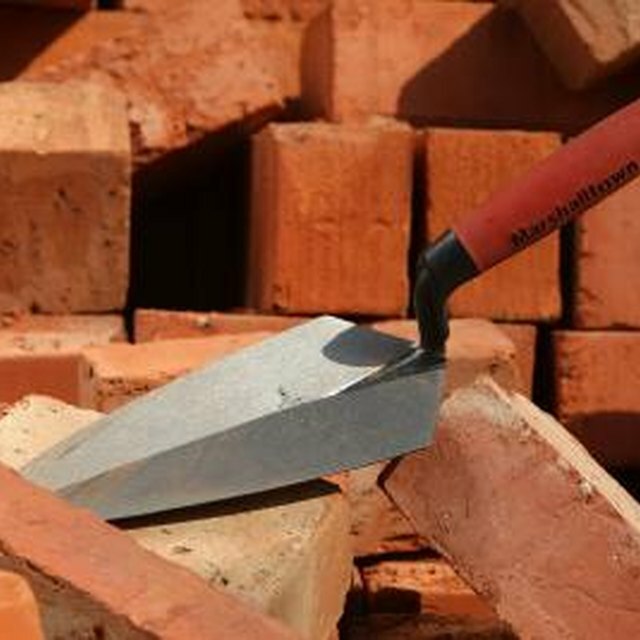 Beginners should know bricklaying basics and practice the craft before pursuing large projects. Bricklaying for beginners involves lots of practice to create sound walls and structures. Perhaps the most essential tool in a bricklayer's arsenal is a brick trowel. Brick trowels come in many shapes and sizes, and can be 10 to 14 inches long. One side is rounded and the other side is flat. A narrow trowel is ideal for beginners because it is easier to handle. Pointing trowels are smaller than brick trowels and have 2 straight edges; they are used to finish brickwork. When not in use, trowels should be cleaned and oiled to prevent rust. A 2- to 4-foot level is needed to check that the bricks are level horizontally and vertically; torpedo levels are smaller, but serve the same purpose. Two-pound sledgehammers, brick chisels, cold chisels and brick hammers are used to cut bricks to fit in place; a wet saw with a diamond-tipped blade may also be used. When laying bricks, a string line is useful in helping the bricklayer to determine if the bricks are level without having to pull out a leveling tool for each brick. Pins are inserted into mortar joints and a string is run between the pins, set at the desired height for the next level of bricks. If the line is sagging, it does not provide an accurate height measurement, so tools like corner blocks and tingle plates are used to hold the line up. Corner blocks are used on either side of a corner to hold the line up while brick is laid; a tingle plate is held down with a brick and holds up long lengths of line between cutouts on the plate. Stretch a string to serve as the height guideline for the brick wall or structure. Lay the bricks out before setting any in place with mortar. Pick up a pear-shaped scoop of mortar with the trowel. Pick up 1 brick from the line and flick the mortar into its place; flatten the mortar and make an indentation. Lay the brick into place and adjust it until it is level; repeat this with the brick on the other end and work your way toward the middle. Follow the same procedure with the rest of the bricks, but spread a bit of mortar onto the ends so that they fit together on the sides. Use a level to make sure the corners are straight. Continue laying bricks this way for each level, making sure to use enough mortar to fill all the joints between the bricks. When laying multiple levels of bricks, brick masons build up the corners a level or 2 before laying brick across the entire line. Practice laying corners repeatedly, because this is the part of bricklaying that is most difficult to master and that is most important to the integrity of the structure. Build the corner with 7 bricks: 4 bricks on the bottom level and 3 on the next level up. The second level of bricks should be staggered on the bottom layer. For example, if the bottom brick that is pushed into the corner runs north to south, then the corner brick on the next level should run east to west. Every other layer of bricks will have an identical pattern. A beginner bricklayer should practice his skills before taking on large projects that demand structural integrity. Start by laying a small brick wall that serves no other purpose than to allow practice time. Mix the mortar so that it contains more sand than cement mix, such as 8 parts sand to 1 part mortar. It still has a mortar-like consistency and will bind the bricks together, but it is easy to break apart so that mistakes can be corrected and the wall can be dismantled when you are satisfied with your work.